Admissions rates of 6 percent? Kids applying to thirty-two colleges? Sixteen-year-olds with more impressive resumes than Fortune 500 CEOs? Has the nation lost its mind? Why yes, it has J.D. 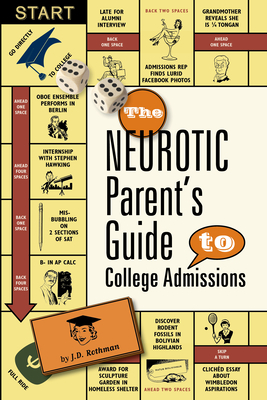 Rothman, the Neurotic Parent of blog fame, takes readers on a hilarious satiric journey through today's insane college admissions process. The vividly illustrated book takes you from the Itsy-Bitsy Fiske Guide and Junior Kumon Tips for Preschoolers through Rejection Letters from the Heart and Bed Bath & Bye-Bye. J.D. Rothman: J.D. (Judy) Rothman is an Emmy-winning screenwriter and lyricist specializing in comedy and children's programming. She coped with the stress of her son's college-application process by becoming the blogger The Neurotic Parent, which later inspired the book. She also contributed to I'm Going to College, Not You (St. Martin's).